Business book reviewer Jim Pawlak says “Who Moved My Cheese?” has been replaced by “Who Moved My Cube?" The new, eye-opening book, The New World of Work: From the Cube to the Cloud, spotlights the evolution of work from a traditional office environment to successful telecommuting scenarios and virtual teams. Co-authors, Tim Houlne, CEO of Working Solutions, and Terri Maxwell, CEO of Succeed on Purpose, detail the economic progress from the industrial revolution to the information revolution and now the virtualized, globalized and fractionalized new world of work. The authors have donated books to their alma mater, University of Texas at Dallas (UTD) to allow a fifty percent discount through March 31, 2013, at the UTD Bookstore. View a video book trailer here. 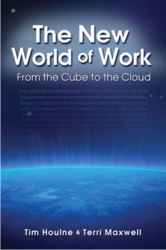 The New World of Work: From the Cube to the Cloud is the new, eye-opening book that underscores startling statistics about the global labor force. The New World of Work describes the transformation of virtual work platforms and talent-sourcing that is revolutionizing not just how and where work is performed, but the way business is being done. The book provides the knowledge to propel careers and businesses forward with a better understanding of next-generation work by explaining how to become a Virtualpreneur™ and highlighting how businesses can compete for virtual talent.